Whether they’re out of sight or on the surface, count on Fiberon deck fasteners for a lasting hold, easy installation, and a look you’re sure to love. Fiberon Phantom hidden fasteners keep deck boards secure and provide a smooth surface that’s a treat for your eyes as well as your toes. Prefer a more traditional approach? Choose Fiberon Cortex face fasteners. Installed on the decking surface, Cortex fasteners grip tight. And they include color-matched plugs to minimize the hardware’s appearance and ensure a beautiful, flawless finish. The new Fiberon Phantom® Universal Hidden Fastener installs easily, helps minimize lateral board movement, and is priced right. Available in boxes of 90 (50 sq. ft. of coverage) and buckets of 900 (500 sq. ft. of coverage) for 16” on-center installations. Available at stocking dealers. See Technical Information below. Fiberon Symmetry, Horizon, ProTect Advantage, Good Life, and Veranda Decking (available at Home Depot). Also compatible with most leading composite grooved decking. For a smooth deck surface and seamless transition from the indoors to the outdoors, choose Fiberon Phantom GT and Phantom EC (End Clips) Hidden Fasteners. Phantom GT Fasteners work with Symmetry, Horizon, ProTect Advantage, Sanctuary, and Good Life Decking. Phantom EC Fasteners work with all of the decking lines above plus Paramount PVC Decking (see approved fastening systems for Paramount PVC Decking grooved edge interior boards). Designed specifically for use with Paramount PVC perimeter boards, Phantom 20EC (End Clip) Fasteners offer the same superior holding power as the rest of the Phantom Hidden Fasteners collection. See approved fastening systems for Paramount PVC Decking interior boards. *Note: For any fastener application that is exposed to salt air, near large bodies of water, swimming pools, or other areas where corrosion is more likely to occur, always use 305-grade or 316-grade stainless steel screws. Choose the best fastener based on the material being fastened and the environmental conditions of the project location . For a traditional face-fastened look, choose Fiberon Cortex screws – the only hidden face fasteners approved for Fiberon decking. Easy to install, Cortex screws work with a special driving tip that automatically places the screw at the precise depth. A color-matched plug minimizes the appearance of hardware. So you get a cleaner, more attractive decking surface. Fiberon Symmetry, Horizon, ProTect Advantage Decking. 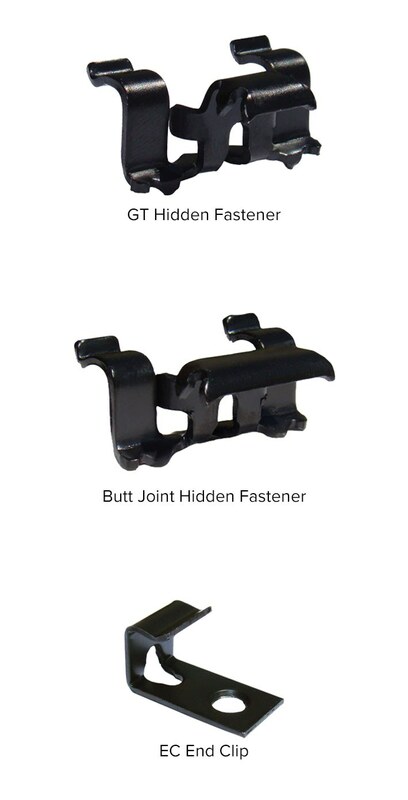 Phantom Hidden Fasteners are backed by a 20-year limited residential warranty and a 5-year limited commercial warranty. For details, see complete warranty information. Fiberon approved fasteners are designed to accommodate normal dimensional changes without material fracture or change in holding capability and are recommended for installation of Fiberon decking products. Any use of unapproved fasteners, including biscuits or nails, may lead to product failure and void the product warranty. Always refer to Fiberon installation instructions for details. 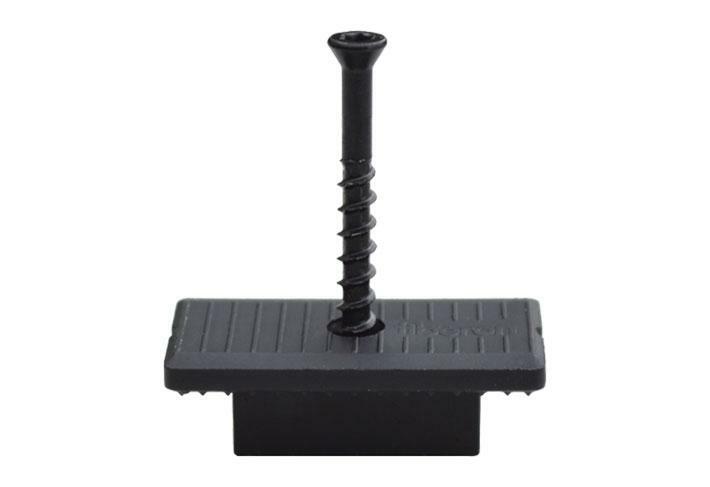 Black polypropylene fastener includes a pre-inserted carbon steel-coated screw with a trademarked specialty coating designed to ensure proper coverage and corrosion protection. This four-step coating process exceeds the standards set forth in ASTM A153 “Standard Specification for Zinc Coating (Hot-Dip) on Iron and Steel Hardware. Exceeds 1500-hour ASTM B-117 Salt Spray Test. Available in boxes of 90 pre-inserted screws with T-15 star-head drive (50 sq. ft. of coverage) for 16” on-center installations. Also available in buckets of 900 pre-inserted screws with T-15 star-head drive (500 sq. ft.) for 16" on-center installations. Use Fiberon Phantom EC (End Clips) Hidden Fasteners to eliminate surface fasteners on the beginning and end boards of the deck. Phantom EC (End Clip) Fasteners are sold separately. Each bag includes 25 clips, 40 screws and driver bit for 25 l/f coverage, 12 in. on-center installations. All colors available in boxes to cover 100 l/f for 12 in. on-center or 140 l/f for 16 in. on-center joist installation. Box includes 224 2-½” screws, 300 color-matched plugs and two setting tools. Fiberon-approved fasteners are designed to accommodate normal dimensional changes without material fracture or change in holding capability and are recommended for installation of Fiberon decking products. Any use of unapproved fasteners, including biscuits or nails, may lead to product failure and void the product warranty. *Note: For any fastener application that is exposed to salt air, near large bodies of water, swimming pools, or other areas where corrosion is more likely to occur, always use 305-grade or 316-grade stainless steel screws. Choose the best fastener based on the material being fastened and the environmental conditions of the project location.